Well, that was an experience I could never have expected or planned for my year in Germany! World Cup Champions! How exciting. I had secretly been hoping that this would happen since the Cup started. Of course I was rooting for the USA, but if they had pulled off a miracle and advanced further or won, I would have been a bit disappointed to not be home for that. 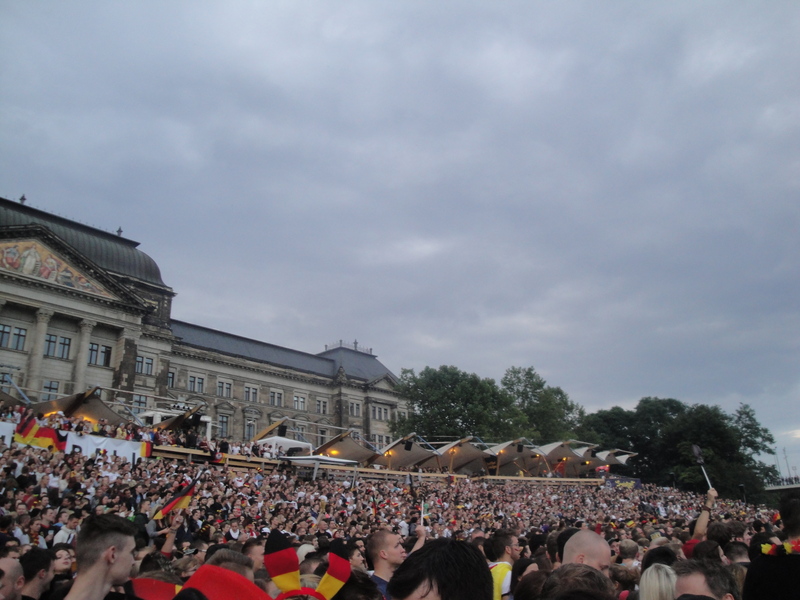 Watching Germany during the last month has been so much fun! Germany is basically the total opposite of America when it comes to patriotism or national spirit, but things are different during the World Cup. Actually, the tides of “German patriotism” changed ever so slightly when the World Cup was hosted here in 2006, and now it is slightly acceptable to catch a glimpse of a German flag from time to time. But to be in a crowd of hundreds of Germans singing the national anthem before the game? It was a wonderful and rare experience. The game itself was suspenseful. At least it was clear that the teams were well matched! 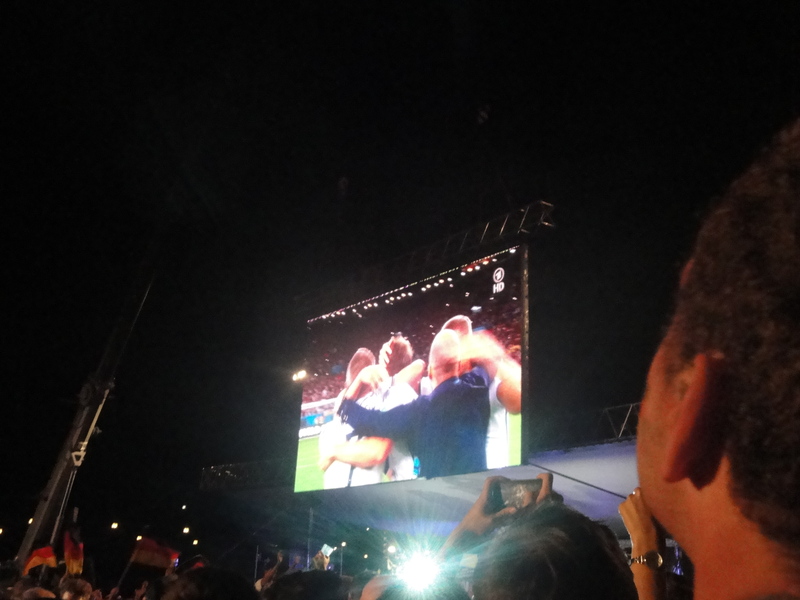 But I did get the feeling, especially towards the end when poor Schweinsteiger was getting tossed around so violently (but kind of for the whole game) that Argentina was getting calls that Germany just wasn’t. It was less pleasant still when a 6’5″ chain smoker decided to come stand squarely in front of me at halftime and stay there for the rest of the game, through both periods of extra time. My feet and ankles were getting so tired from standing on my tip-toes that, when Götze finally scored, I had resigned myself to not being able to see the screen anymore… luckily, I did indeed see the fateful goal! And the place erupted. It was unreal. 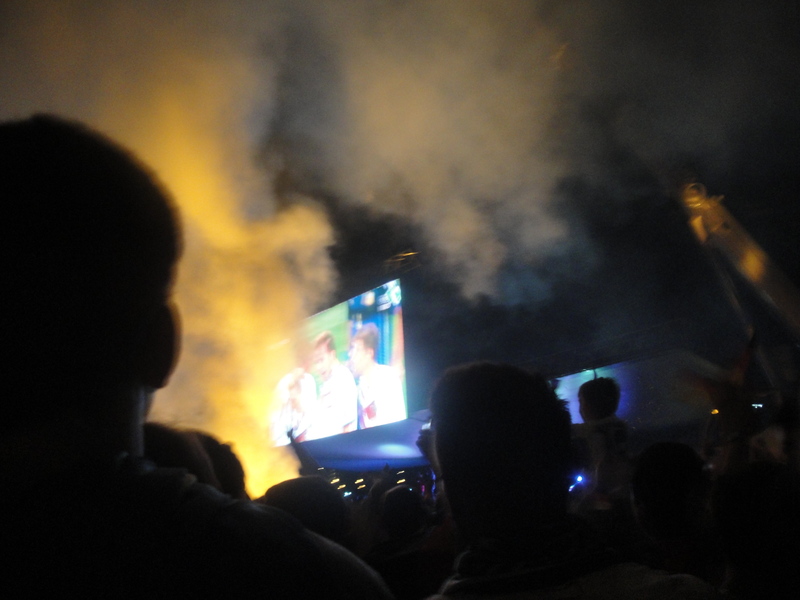 The uproar subsided shortly while Messi took his penalty kick, but then once the final whistle blew… Wahnsinn. We celebrated as we watched the players and teams receive their awards (Neuer hugging Angela Merkel was probably the funniest thing of the evening) and finally the Cup was awarded!! Then we set out on an epic hour-long journey to get home amid totally packed tram cars and people driving crazily down the street, honking their horns and waving flags out their windows! I was exhausted when I finally got home (and I hadn’t eaten in almost 10 hours thanks to some craziness in getting to the game) but still exhilarated. 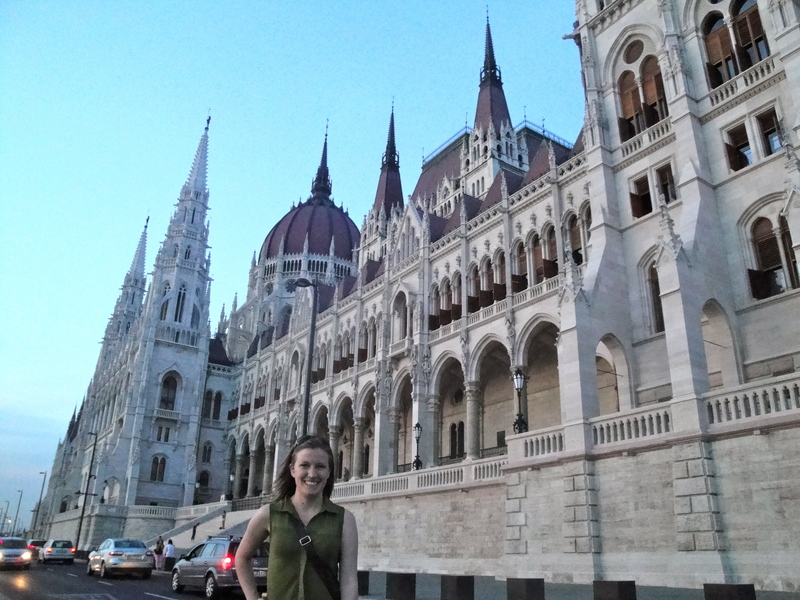 I’m interrupting my regularly-scheduled activities of fact-checking, Works Cited-making, and wearing the same 3 outfits over and over again for the next three weeks to tell the blogosphere all about my fantastic and wonderful and magical trip to Budapest this weekend!! It was my last big international trip before the biggest international trip (home), and what an incredible one it was!!! I truly loved the city and had a fabulous time, and I’m excited to share some of my pictures and stories with y’all! 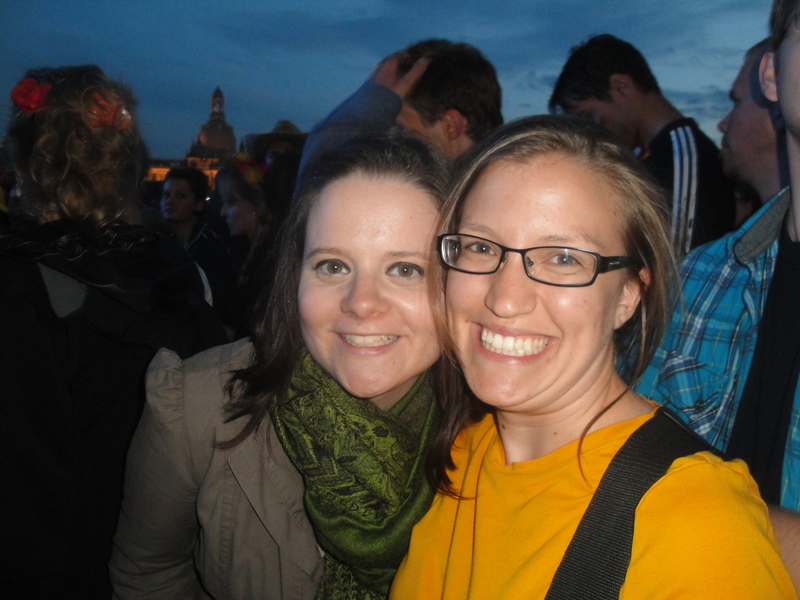 Felicitas and I chose to go to Budapest because our friend Domi, who studied in Dresden last semester, lives there, which was as good a reason as any to pick one city over another! A few of our friends had gone several weeks ago to visit Domi and we had heard great things from them, so we were really excited for the trip. We used airbnb to book an apartment for the weekend… I think this is a relatively new start-up, or at least new to me, and we had a great experience with the guy we rented from. The best feature of the apartment (besides the great location and totally unreal price) was that it included the use of 2 bikes, which was absolutely clutch. No public transit for us! We arrived in the early afternoon on Friday (July 4th, for anyone keeping track) and made our way from the airport to the apartment with only some minor confusion, and as soon as we had dropped off our stuff, changed into cooler clothes (it was HOT), and figured out the bikes, we were off to see what Budapest had to offer! 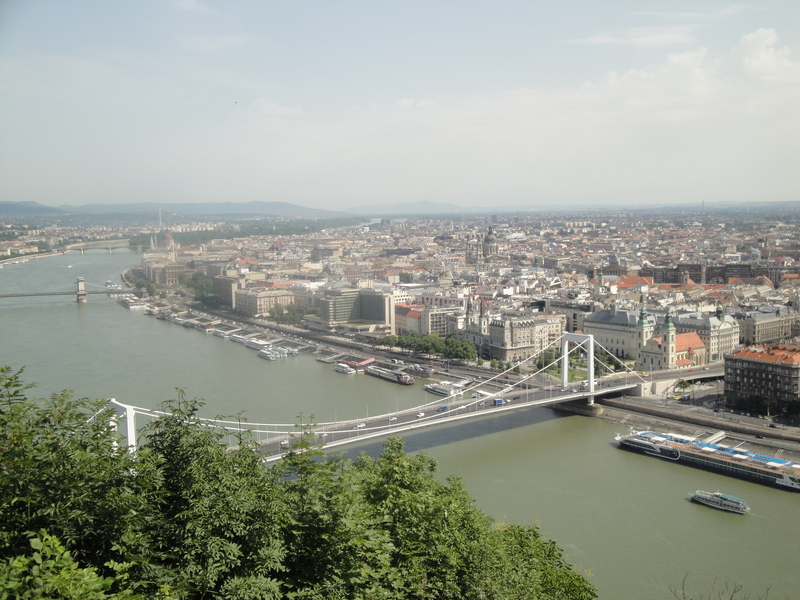 Budapest, if you don’t know, is actually the “fusion” of two cities, Buda and Pest, each lying on one side of the Danube River, so the river dominates the city landscape and most of the major sites are along it. And, like most cities on rivers, the bridges are all-important. It was crazy how much bigger Budapest’s bridges are than Dresden’s, though not surprising when you observe how much bigger the Danube is at Budapest than the Elbe at Dresden (esp. this year). We were really hungry and we (I) were (was) starting to get hangry, specifically, so we tried to find somewhere to eat something inexpensive that would still leave us free for dinner a few hours later. We settled for some pastries right before stumbling upon the first of many great discoveries: the Budapest Central Market! We thought it was the train station at first, which should clue you into how big it really is, but it’s just full of stands and kiosks selling fresh produce, dairy products, dried fruit, meats, spices, etc. etc. etc. Absolutely magical. I wish I could shop there every week. With some cherries and nectarines in tow, we set off to see as much of the city as we could before finding a viewing location for Germany’s quarter final World Cup game at 6. 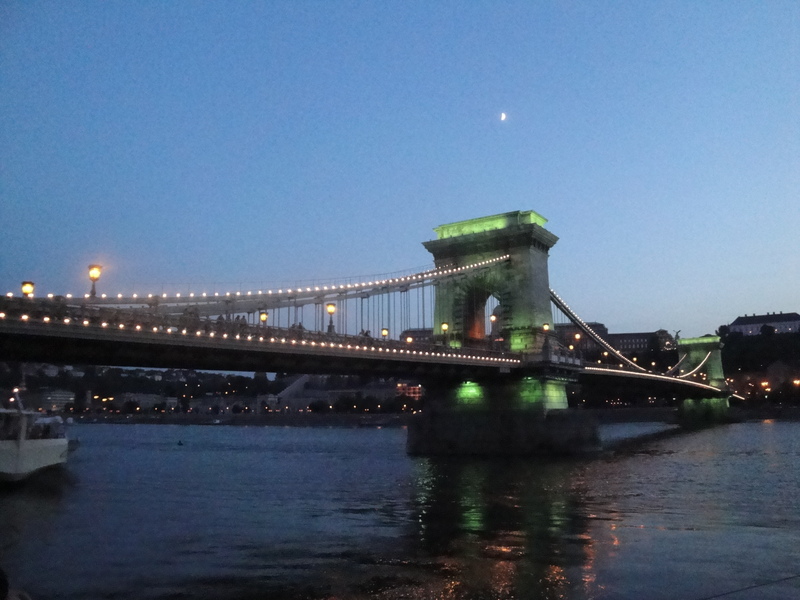 We didn’t get to see MUCH in the limited time we had, especially while getting used to the… not exactly perfect quality of the bikes, but we crossed the famous (and beautiful and massive) Chain Bridge, saw the Citadel up on its hill, and observed the locations of some of Budapest’s more famous sites: the cathedral, fisherman’s bastion, and Parliament. It was great that we were able to cruise up and down the river (well, parallel to it on bike paths) as we oriented ourselves and made plans for the next day. 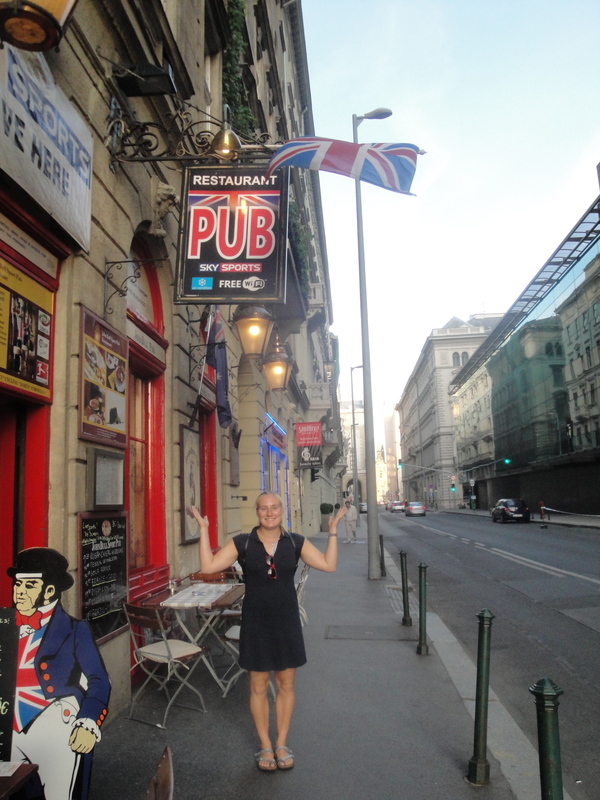 And then, we staked out our World Cup viewing spot, which was hilariously a British pub… on the 4th of July. We enjoyed our meal and a few beverages while watching the relatively uneventful game (but GERMANY WON!) and hiding our disdain of the rowdy and rude international clientele at the pub. Then Felicitas discovered that she had lost her iPod, which was a huge bummer. I resolved to take twice as many pictures for the both of us, the results of which promise you have already partially experienced, dear reader. 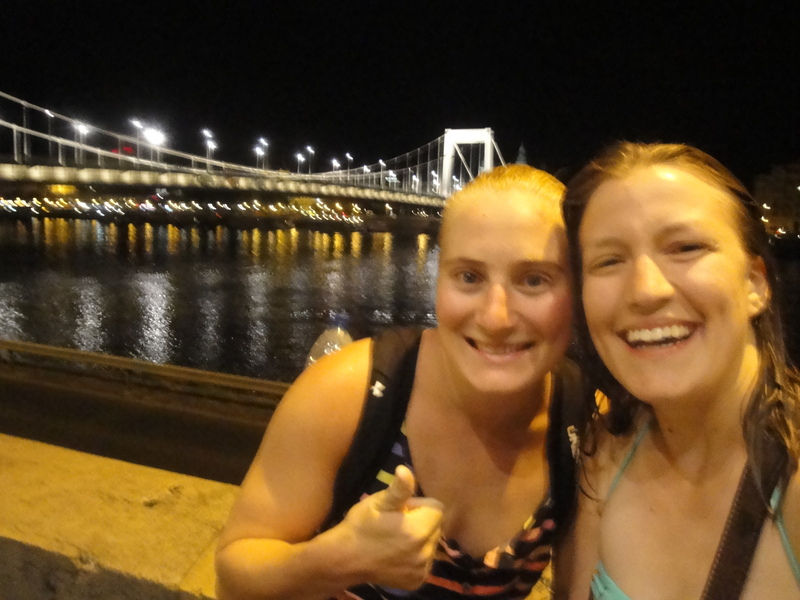 We rode back to the apartment as the sun was setting and night was falling and experienced the most magical of Budapest experiences: everything lit up at night! It was so gorgeous. 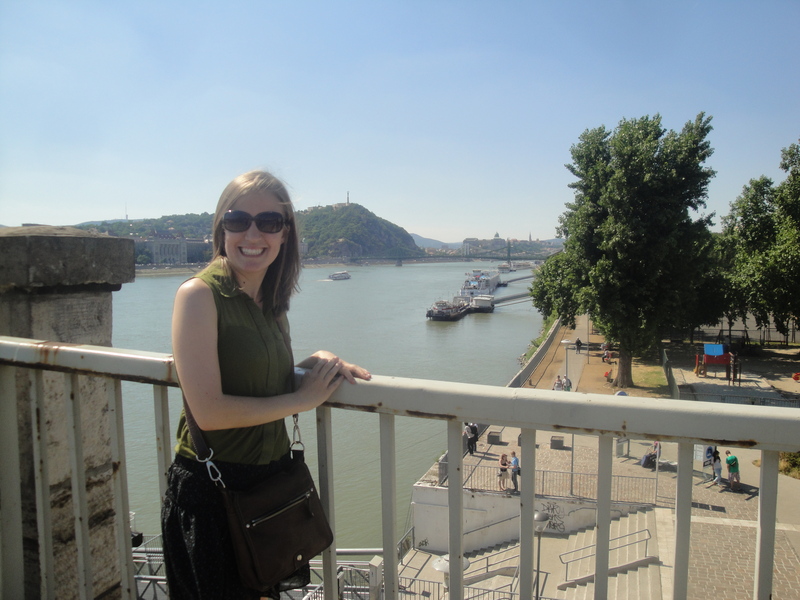 The next day started bright and early with another trip to the market to stock up on fruit, cheese, and bread for the day, before we headed across to the Buda side of the river. We parked our bikes at the bottom of the Gellert hill and hiked up to the top, where the Citadel is located. We were surprised to learn that the fortress had only been constructed in the 19th century! It has now fallen into disuse, but the Citadel as a symbol of political power was a complicated topic during the Austro-Hungarian Empire years (it was seen as an imposition of Austrian power on the Hungarians), as well as during the Nazi occupation through to the Communist regime. Besides learning some of the history behind the structure, we also enjoyed fantastic views of the city. 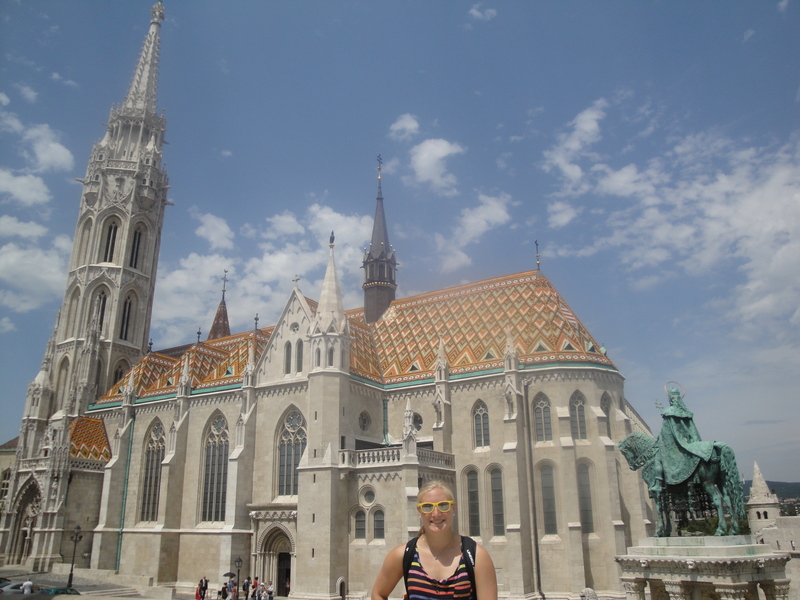 Continuing to follow the Danube north, we climbed up to see the Royal Palace, which is absolutely stunning. It is an imposing but beautiful presence up on its hill, overlooking the river, and the grounds, including the surrounding buildings of the National Gallery, are all very picturesque. We scored some free tap water from the restrooms in the Palace (again, SO HOT. 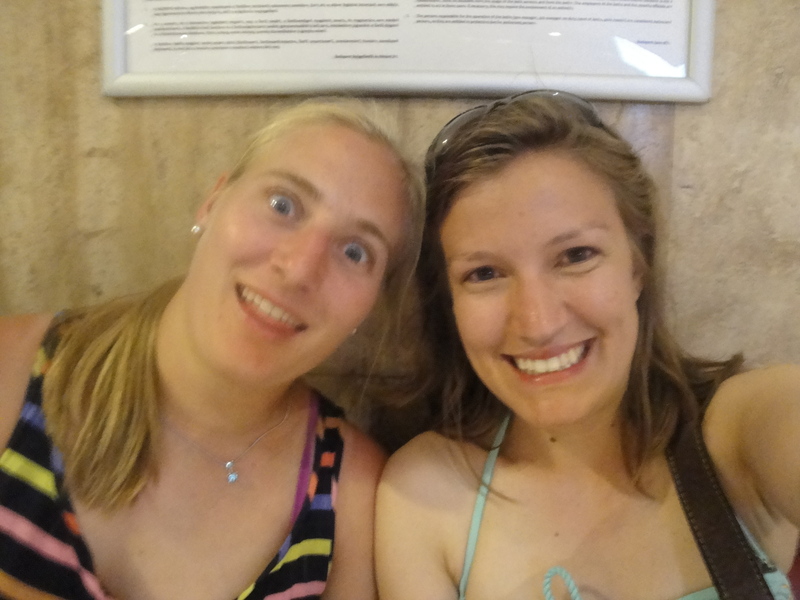 We were staving off dehydration the whole day) and continued walking north to the Cathedral. St. Matthias’ Cathedral is one of the more distinctive churches I’ve seen. It’s built in a gothic/probably neo-gothic style, but the building itself is very bright because it’s built all in white stone! And it has a colorful, tiled roof. The whole thing was an interesting mix of western (gothic) and eastern (almost byzantine) aesthetics, including the inside! A lot of the decorations were geometric, which reminded us of some Islamic decorations (no graven images). Right in front of St. Matthias’ is the Fisherman’s Bastion, a word that doesn’t mean a whole lot to me but I think it’s some sort of fortress or embarkment. Regardless of what its purpose is/was (and I don’t remember actually learning any of the history for this particular structure… oops), it is very unique and striking… and offers some gorgeous views, as well, and it’s one of the defining landmarks of the city. After exploring a bit more of the Buda side, we crossed over the Chain Bridge to Pest; first stop, St. Steven’s Basilica. The Basilica is the biggest Catholic church in the city, and it could fit right in in Rome as far as I’m concerned! When we first went in the church, they were getting ready to have a wedding, so we could only see a small part of it. 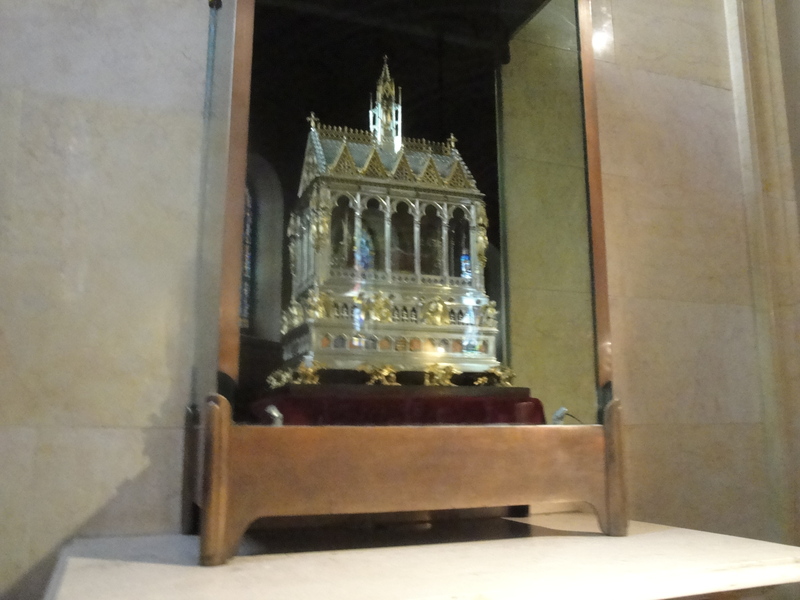 However, a short time later we came back with our walking tour and got to see the whole thing! 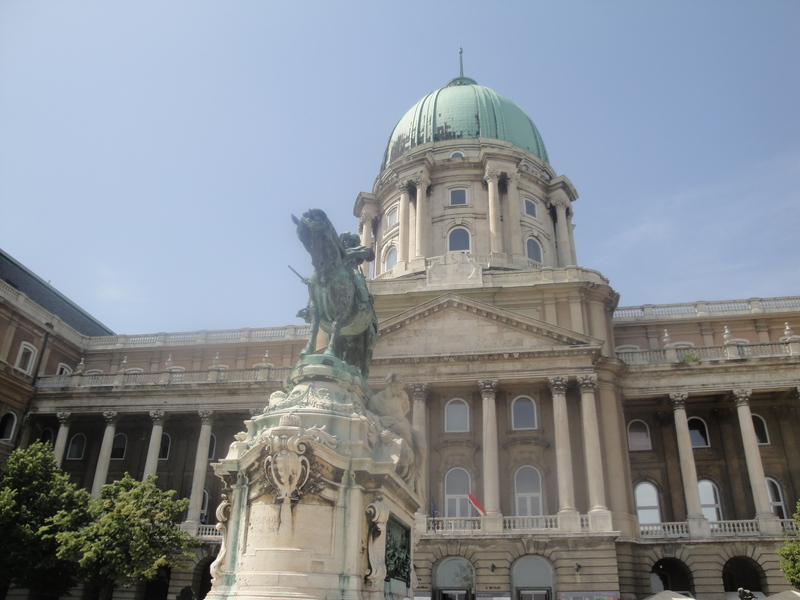 Our tour was the “Essential Pest” tour and concentrated a lot on sites with historical meaning, so we learned a lot about the history of the Hungarian people, religious milestones, and events during the Communist period from 1945-1990. 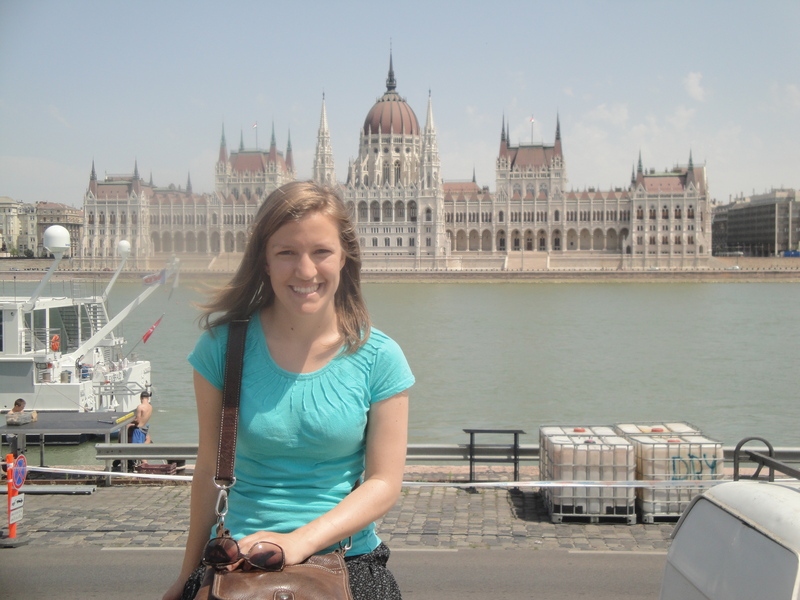 One interesting fact: the roots of the Hungarian people and language are actually in Asia! They claim Attila the Hun as their great ancestor, and the Hungarian tribe was one of the tribes he ruled. On the tour, in addition to the Basilica, we saw many historical landmarks and statues (many of them Communist but some hearkening back to the Austro-Hungarian days), Liberty Square, a nuclear bunker, the former Hungarian television headquarters (which was closed after it was attacked by protesters in 2006), and Parliament once again. After the tour was over, we made our way slowly across the city to a church we knew would be having an English mass about an hour later. Domi met us for Mass! It was great to see him again, and to have someone to translate for us! 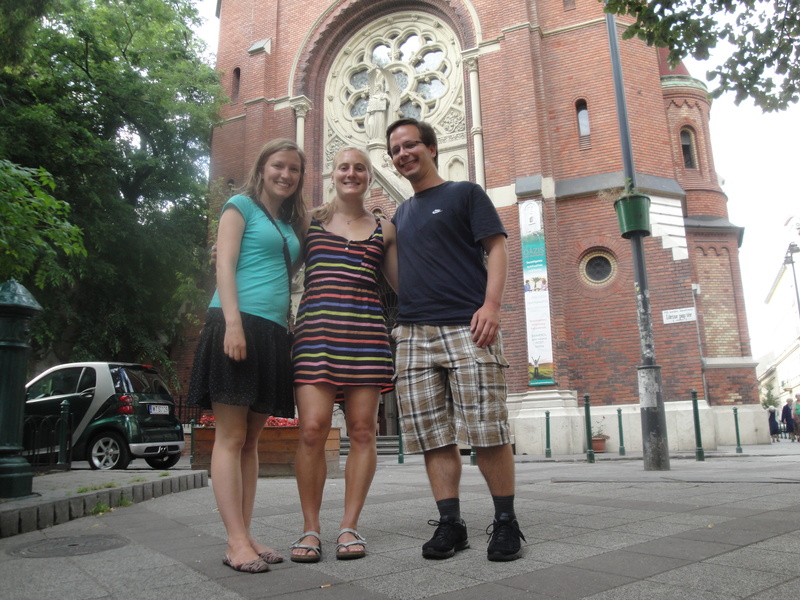 Dresden friends reunited in Budapest! We enjoyed a post-Mass ice cream cone on our way to our next highly-anticipated destination: one of Budapest’s famous thermal baths. Many of these baths were built during the time of Ottoman occupation (Turkish baths, you see), and we definitely wanted to see what the fuss was all about. 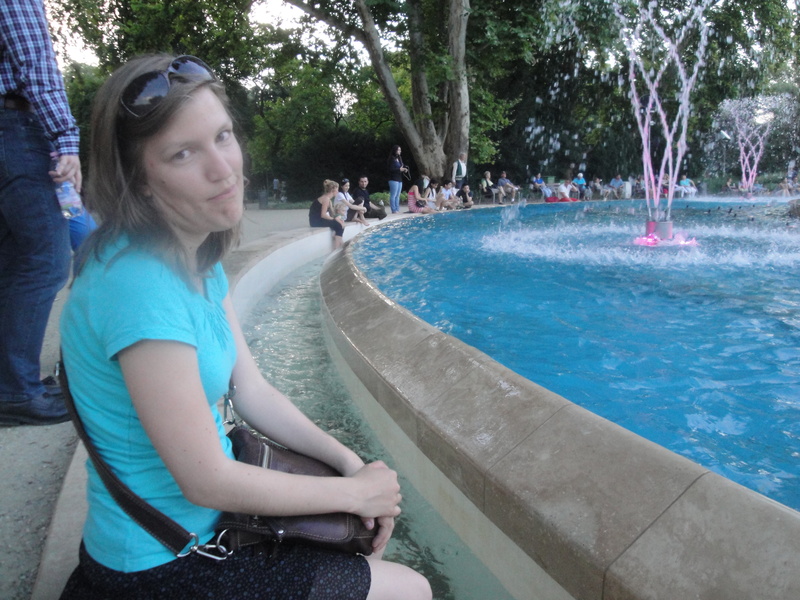 Our original plan was to buy reduced price tickets starting at 7 and stay for a few hours, but it turns out that the bath closed earlier than we had anticipated. Instead of paying full price for only 45 minutes of bathing time, we decided to wait until one of the baths re-opened at 10 pm. 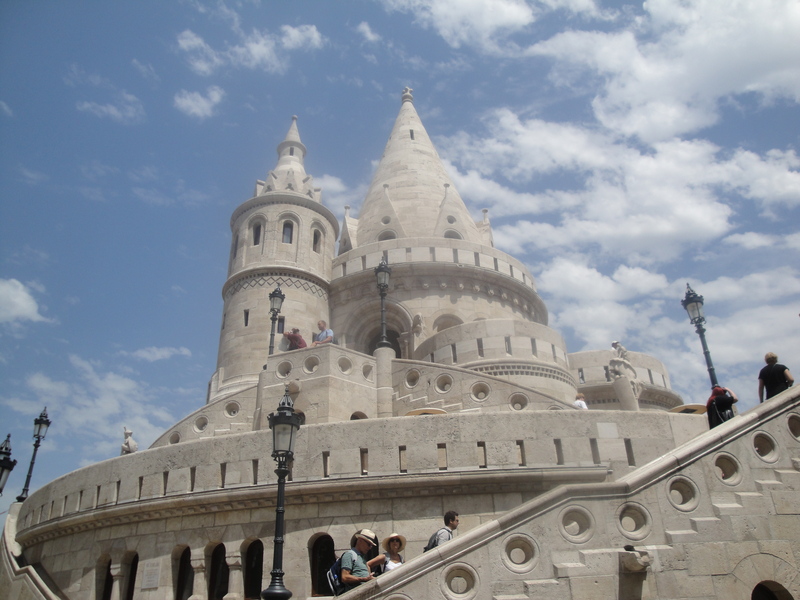 In the meantime, we headed up to Margaret Island, an island in the middle of the Danube between Buda and Pest. It’s named “Margaret” for the daughter of one of Hungary’s kings, who lived in isolation on the island as a nun during her life. (She’s now a saint.) 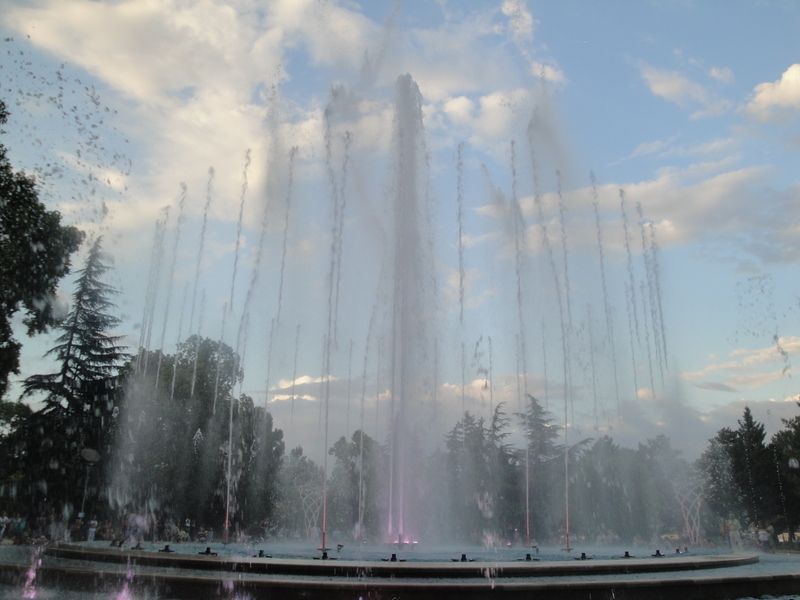 There’s a big fountain on the island, and as we sat down to put our feet in the water, the 8pm water show began! The fountain is synced up with lights and music, and it was such an unexpected surprise! It was nice to be able to sit down and enjoy something relaxing and fun at the end of a long day. We ate the rest of our fruit, and Felicitas and I took a little spin around some of the rest of the park before coming back to enjoy the 9pm show! Some of the music selections: “Cecilia” by Simon and Garfunkel, The Blue Danube, appropriately, and Bruce Springsteen complete with red, white, and blue lights. We returned to the bath in time for the 10pm re-opening, changed into our swimsuits, and bought our tickets (kind of pricy, but worth the splurge). I had no idea what to expect from the baths. It was like being transported to a different world! The bath itself was built in the 16th century, though you would never know from the exterior and the main building, which is modern. The bath itself was a cavernous little room with five separate baths: one in each corner, and a large one in the middle, each one kept at a different temperature. The water is all natural and directly drawn from the earth, though of course it’s cooled and regulated at each temperature. (The whole area smelled faintly of sulphur, a smell that didn’t leave my hair or skin until after my second shower, two days later!) Domi, as he is Hungarian, had been to thermal baths before, and Flitzi had looked up some articles about the best “strategies”: going from the coolest bath to the hottest, then maybe a trip to the steam room or sauna, and then back in the coolest one. We did go in both the steam room and the sauna, though I can’t say I particularly enjoyed either one… I’m more a “cool water” gal. Shortly before leaving, I did take the plunge into the 60-degree “cold tub” which was… only refreshing after having spent time in the 110-degree bath. Overall, I would say it’s absolutely worth it to go to one of these baths while in Budapest. What a crazy and otherworldly experience! I don’t know that I’m really conveying that effectively, and I don’t have any pictures because no cameras were allowed, but I guess you’ll just have to take my word for it. Shortly after midnight, we bid farewell to Domi (he was catching a flight at 6 am and planned on just staying at the bath until 3 am, which I’m sure was a good alternative to sleeping at the airport) and biked back to our apartment, both absolutely collapsing into bed after such an eventful day. Something about a thermal bath at the end of the night will really take it out of ya! On Sunday, we “slept in,” got the apartment ready for our departure, and tried in vain to find a good place to eat breakfast. 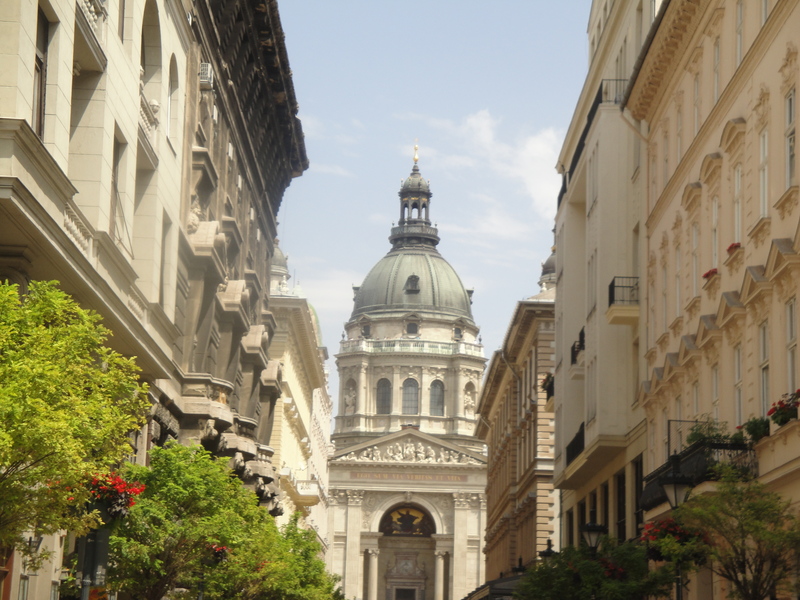 The place we did eat was absolutely terrible and our waiter shortchanged us like CRAZY… but, in our exasperation, we decided not to fight it… we were trying to spend our Hungarian currency, anyway. (We did leave scathing reviews on Tripadvisor after we got home, though.) As we made our way back to the airport and eventually to Dresden by way of Berlin, I was a little sad that this was my last big trip before I return home. However, that sad emotion is always mixed… in this case, I was tired and ready to be in my own bed, as well as knowledgeable of the fact that I will be traveling (just within Germany) for the next two weekends, and of course anticipating my impending trip home!! I can’t believe it’s already mid-July, friends. I just can’t.